'Keep rolling, keep winning, keep score with Yahtzee Score Cards'. NB: Pad Only DICE NOT INCLUDED. Remote, country or distant areas from Brisbane may experience delays due to there location. Got 3 of a kind and feeling lucky?. You might want to push your luck and risk it all for a Yahtzee. But don't forget, you have to fill in a score on every turn. So make it count, or you'll bust out! 2 Yahtzee Score pads with 50 sheets in each new in plastic. 8 to adult. box is 49cm x 25cm x 7cm. milton bradley. Box is also in very good condition. This is not negotiable. 1979 WORD YAHTZEE. 1981 TRIPLE YAHTZEE. 1982 ORIGINAL YAHTZEE. 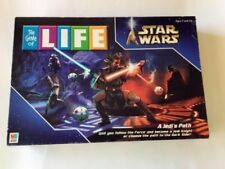 FREE HASBRO CLASSIC. Original YAHTZEE by MB is up for sale. Yahtzee scorepad, Instructions. Show your friends and family how to roll! Hustle for a full house, roll hard for three of a kind, stick with a straight or risk it all for a Yahtzee! Roll it to the limit for the ultimate win! We apologise if this causes any inconvenience. Box is in good order too. New 1997 Yahtzee Deluxe Edition. 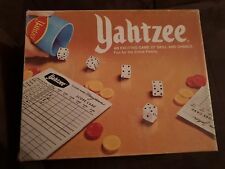 Original YAHTZEE by MB is up for sale. Yahtzee Score-pad. Office Supplies. All of our products are fully backed by manufacturer warranty. All of our products are fully backed by Australian manufacturer warranty. Ends 30/04. T&Cs apply. You changed your mind. 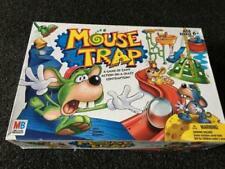 MANUFACTURED BY : MILTON BRADLEY/HASBRO. Rare Vintage Triple Yahtzee 1981 Milton Bradley Really Nice! Rare vintage 1981 Milton Bradley Triple Yahtzee. Box a bit worn, but game in great condition as seen in the photos. Great for any collector! Any questions are welcome. Please check my other listings for other items and figures! Happy to combine shipping where possible. International post available. Price will depend on location. Model E6100. - Yahtzee 80 Score Cards. I may be able to help out. If an item hasn't been paid within 48 hours, an unpaid item case may be opened automatically. Vintage Triple Yahtzee 80 Score Cards 1 Pad in Box Milton Bradley Dice Game 1989. Condition is New. Shipped with USPS Priority Mail. Since 1956, players have been rolling classic dice combinations like Full House, Large Straight. and Five-of-a-Kind. The box has light marks. Yahtzee Free For All~It's Anyone's Game On Every Turn~New & Factory Sealed! There's so much going on when you play Yahtzee Free For All, you're part of the action even when it's not your turn. 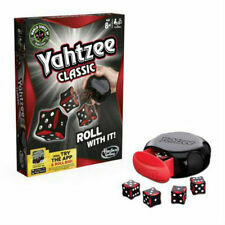 Roll the dice to match cards with classic Yahtzee combinations. If you match one, take it--but now it's "up for grabs" until your next turn, so anybody can steal it by matching or beating your dice roll! Title: Yahtzee. 2005 Parker Brothers Yahtezee New Sealed In Wrap. IF YOU EXPERIENCE PROBLEMS WITH YOUR ITEM(S) WE WILL WORK FAIRLY WITH YOU TO HELP RESOLVE THE ISSUE QUICKLY. WE ARE VERY SORRY FOR THIS AND HOPE YOU UNDERSTAND. This item is a NEW, SEALED. NEW, SEALED. Milton Bradley Yahtzee. 76 Score Cards. NEW, small tear in the factory wrap, shown in the last photo. Plastic dice cup. Fun for the whole family. Triple Yahtzee Score sheets - 3 Incomplete Pads - Dice Game. One pad looks to be complete , while the other 2 have a few sheets removed BONUS - ORIGINAL YAHTZEE SCORE SHEET PAD FROM 1956! Condition is New. Shipped With USPS Priority mail Package. Includes 80 score cards. Its impossible to play Yahtzee without the original score sheets. MUST HAVE ITEM - Its impossible to play Yahtzee without the original score sheets. INCLUDES 80 SHEETS - Includes 80 score cards. Trending at AU $19.64eBay determines this price through a machine-learned model of the product's sale prices within the last 90 days. 1996 YAHTZEE SCORE PADS 80 SCORE CARDS E6100 Sealed! 1996 YAHTZEE SCORE PADS 80 SCORE CARDS E6100 Sealed!. Box has some crushing, but is still sealed. Set of 4 unused Challenge Yahtzee Score Pads (also included is a partial score pad for regular Yahtzee). Dated 1974. We leave that choice to you so check both costs before checking out. All depends on your zip code.